Reading more into the release notes and a little bit of Googling made me realize that FeedDemon had discontinued its NewsGator online synchronization and had replaced it with Google Reader backend. 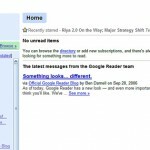 I have never been a fan of Google Reader (I know many are) and I have written about it in the past as well. For me FeedDemon has always been the ideal client to quickly go over thousands of feed items that I get everyday. 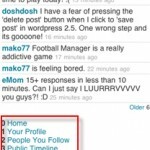 Note: With FeedDemon 3.0 you can even subscribe to your Twitter public timeline and response feeds !